In school days, History was no doubt interesting ! ~ but how authentic was it ? – we studied that Mohandas Karamchand Gandhi fought against the Britishers (who were noble men, strict Officers who taught administration, language, technology and more to Indians and elsewhere they ruled) – freedom was obtained without spilling blood .. (no sword no blood) by mean of ahimsa (non-violence). It was peaceful protests and British saw reason to hand over the administration allowing Jawaharlal Nehru to unfurl Union Jack and raise Indian National flag on that exalted day at Red Fort .. .. .. Freedom Won ~ Congress got us freedom !! The ruling Britishers had been cruel and ruthless in eliminating all those who rose against them .. .. Kwaio is an ethnic group found in central Malaita, in the Solomon Islands. 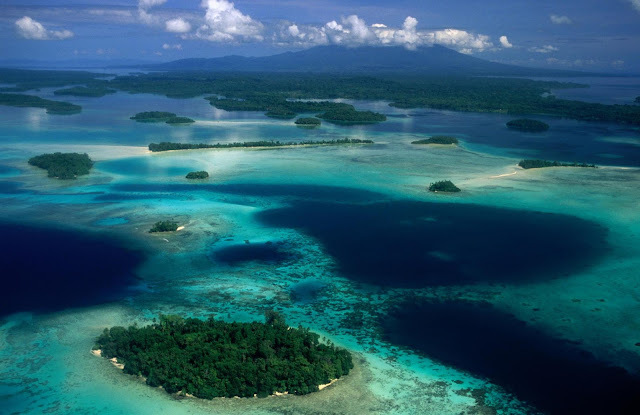 Solomon Islands is a sovereign state consisting of six major islands and over 900 smaller islands in Oceania lying to the east of Papua New Guinea and northwest of Vanuatu and covering a land area of 28,400 square kilometres (11,000 sq mi). The country's capital, Honiara, is located on the island of Guadalcanal. The islands have been inhabited for thousands of years. In 1568, the Spanish navigator Álvaro de Mendaña was the first European to visit them, naming them the Islas Salomón. British occupied it as they did to many many Nations. Centuries later, its name was changed from "the British Solomon Islands Protectorate" to "the Solomon Islands" in 1975, and self-government was achieved the year after. Independence was obtained in 1978 and the name changed to just "Solomon Islands". Today, the sovereign state is a constitutional monarchy with the Queen of Solomon Islands, currently Queen Elizabeth II, as its head of state. Rick Houenipwela is the current prime minister. According to a 2011 census effort, and based on anthropologists' estimates of how many people the island could support, there are probably somewhere between 80 and 150 people on North Sentinel Island, although it could be as many as 500 or as few as 15. The Sentinelese people are related to other indigenous groups in the Andaman Islands, a chain of islands in India's Bay of Bengal, but they've been isolated for long enough that other Andaman groups, like the Onge and the Jarawa, can't understand their language. Centuries ago, British decided to declare Sentinel Island part of Britain's colonial holdings, a decision which really mattered only to the British until 1880. That's when a young Royal Navy officer named Maurice Vidal Portman took charge of the Andaman and Nicobar colony. Portman fancied himself an anthropologist, and in 1880 he landed on North Sentinel Island with a large party of naval officers, convicts from the penal colony on Great Andaman Island, and Andamanese trackers. They found only hastily-abandoned villages; the people seem to have seen the intruders coming and fled to hiding places further inland. But one elderly couple and four children must have lagged behind, and Portman and his search party captured them and carried them off to Port Blair, the colonial capital on South Andaman Island. Soon, all six of the kidnapped Sentinelese became desperately sick, and the elderly couple died in Port Blair. Portman somehow decided it was a good idea to drop off the four sick childen on the beach of North Sentinel along with a small pile of gifts. We have no way to know whether the children spread their illness to the rest of their people, or what its impact might have been. Now read (from MailOnline) what British did to Solomon Islanders – a conflict when 60 tribesmen were slaughtered in retaliation for killing of British officer. The tensions between the Kwaio and the Western world that this reconciliation ceremony sought to alleviate came to a head in 1927. This was when the Solomon Islands were a British protectorate. Rebelling against colonial rule and a tax imposed on his people, Kwaio leader Basiana killed William Bell, a district officer. In retaliation, British authorities launched a punitive expedition, sending Australian and Solomon Islands forces to murder more than 60 Kwaio. They also defaced shrines to ancestors, whom the Kwaio worship in religious practice. Since 2015, Dr Lavery and the group of Australian researchers have worked with Kwaio locals to navigate Malaita's lush rainforests in search of the giant rat and monkey-faced bat. On these expeditions, the Kwaio would cite unrest among ancestors as a threat to both the goal of finding the mammals and the scientists' safety. Now the search for a giant rat and a monkey-faced bat have helped heal long-standing colonial wounds. The paper, published in Nature, spurred on conversations about the reconciliation ceremony. 'Our experience shows that all parties can benefit from biodiversity surveys if they respect local cultural processes and are built on mutual collaboration', researchers wrote in the paper. How it will benefit the islanders and in what way these are healing the wounds cast by mass killings – only researchers know. Back home, it is forbidden by law for strangers to enter the North Sentinel Island. So far, the police have arrested several fishermen who helped ferry Chau to the island ~ so the Western World and media would perhaps better remain silent or admit that it was wrong on the part of the intruder and nothing wrong on the Sentinels who want to live peacefully in their own land. History has it that intruders have swarmed in every areas, fought to establish their rule, bringing the locals as slaves and taking away all their riches – it has never benefitted those who were invaded and ruled – all benefits inure only to those invaders. It is basic duty and privilege for everyone to keep their land in their own custody with their own laws prevalent. One would not apply a Norwegian or Sinhalese law in Paris or London.